Hi, I’m Teddy. Welcome to my blog! Here’s a report of our last 2 days of filming. Days 6 & 7 are our Bible reading days. The older kids work really hard on these days. They did a wonderful job reading all the Bible verses when it came their turn to read. We had another 2 busy days filming. More singing and we also filmed some door openers for the beginning of the episodes. Elijah, one of our graduated kids came back to help James in the control room. Thanks Elijah for your help! We have more photos to share with you of some of the behind the scenes shots of our official first day back on set. We got a quick practise in with the kids and Braeden, our new song leader, before our first filming day on set. It’s been 5 weeks since we filmed season 4 of A Day With the King. We thought we might give you a running report of how it all went. We are busy getting everything ready for filming season 4 in January. We have another exciting series planned for you. Teddy has been for his annual check up and has a clean bill of health. You can see his photos down below from his visit to the vet. Hi Girls and Boys, it’s been a while since we have shared any news with you but we have been very busy. Our new season, season number 3, is now airing on 3ABN International. It’s on 3:30 on Friday afternoons and 7:30 on Sabbath mornings – AEST. If you missed an episode go to the link on the homepage and it will take you to the 3ABN Australia website and you can catch up on a missed episode anytime. Hi Boys and Girls, we have just finished our filming for season 3 of A Day With The King. The kids were so wonderful and did a fantastic job. Teddy put in a wonderful performance of sitting so well on the couch. You will have to wait and see the last episode of season 3 to see who came along to join him on the program! Hi Boys and Girls, only 6 more weeks to go and we will be in the 3ABN Australia studio filming season 3! Just a note to let you know that the first episode of Season 2 of ‘A Day With The King’ is ready to air on the 1st of May 2015. The crew at 3ABN Australia have been very busy with post-production bringing it all together. TapClick here to download Study Guides! 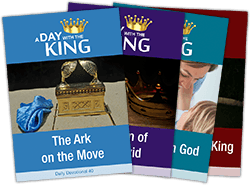 A Day With the King is a production of 3ABN Australia. Copyright © 2018, 3ABN Australia Inc. All rights reserved.